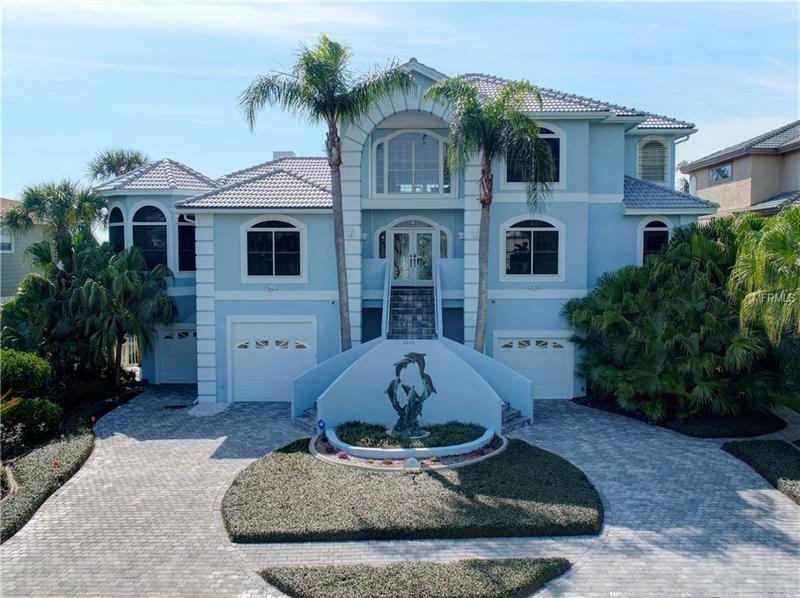 Exquisite contemporary w/ uninhibited views of the Gulf of Mexico! Built in 1993 w/ 4148 square feet of living area this home offers a wide-open floor plan w/ 4 bedrooms 2.5 baths loft 3-stop elevator and a 3+ car garage. Custom etched glass French doors invite you into the Foyer which opens to a Formal Dining Room and an expansive two-story Great Room w/ tray ceiling and large glass sliders with sweeping views of the Gulf. Beautiful hardwood flooring and a natural gas fireplace surrounded by a wet bar w/ sink & wine cooler and built in cabinetry. The gourmet Kitchen features stainless-steel appliances plentiful cabinetry granite counters w/ breakfast bar island breakfast nook. Enjoy breathtaking sunsets from the open deck. The sizeable Master Suite has a Sitting Area two walk-in closets and a private balcony overlooking the Gulf. The luxurious Master Bath has granite counters dual sinks and a large glass shower & jetted tub. A half bath for guests and another Bedroom (currently being used as an office) are on this level along w/ a laundry room w/ cabinetry & utility sink. The third level offers two other bedrooms for family or guests; both share a Guest Bath and a large loft overlooking the Great Room and the Gulf. The rear of the home has a Key West atmosphere with a relaxing heated pool & spa. Beautiful pathways manicured tropical landscaping and of course; the Gulf of Mexico beyond completes the scene. AC units are 2 to 5 years new (multiple zoned units). Roof is 5 yrs. new.